The good news: The sales reps on your team are energized about what you’re selling and who you’re selling to. The bad news: It’s your responsibility to set their sales quota. You’re torn between what you think is achievable and what’s being pushed by the CEO, the board, and the rest of the leadership team. See the tool sales reps are using to close 35% more business. Below are two different strategies for setting sales quotas and a simple calculator vetted by Yesware leadership and reps. If less than 50 percent of the people at your organization are making quota, you need to re-evaluate. The quotas that challenge sales reps beyond their abilities end up backfiring. Every. Single. Time. 1. It creates a negative view of management & a self-fulfilling prophecy of failure. Reps experience the Pygmalion effect (the negative version). 2. It causes employees to disengage and produce lower sales than with realistic goals. 3. It costs your company money through increased turnover and new hire onboarding. According to a study by SiriusDecisions, ‘quota assignment’ is the #2 reason why sales reps voluntarily leave a company — #1 being ‘confidence in offering portfolio,’ which affects a rep’s ability to make their quota. Bear in mind: every time an employee leaves, it can cost their employer 200 percent of their annual salary. How does that compare to an average deal size at your company? 4. It promotes over-aggressive and unethical behaviors toward prospective customers. The recent Wells Fargo scandal proves this one; employees at the company were sued for allegedly creating fake accounts to meet their sales quotas. Evidence shows that over 5,000 employees set up millions of false, untraceable accounts for customers with bogus contact information like noname@wellsfargo.com. Why? Because they had daily thresholds that they were pressured by management to meet — ones that they weren’t making on their own through real relationships with customers. According to the New York Times, the situation has cost the firm $185 million in fines. It also led the company to eliminate retail sales quotas altogether in September of 2016. 5. Reps devalue established sales processes, and it affects other teams. Quotas focus on closing deals, not starting them. Setting them too high encourages reps to neglect activities like nurturing leads and updating opportunities and other info in their CRM. And this hurts service-level agreements (SLAs) with teams like sales operations and marketing. 6. Perceived unfairness creates a dichotomy within one team. Top performers watch under-performers make lower goals (and money from those deals) without a problem, and they become frustrated. Failing to reward the best salespeople for their results and setting them up instead with unattainable quotas can hurt team morale in a noticeable way. 7. An unattainable quota promotes systemic padding. As suggested sales goals are passed from one sales leader to another, percentages are typically tacked on as a cushion. The result is that 15%+ is added to an original goal, and salespeople recognize these goals as being unrealistic. Because of it, in some cases only 30% of contributors hit their individual number. 8. Forced rankings lead reps to purposefully underperform. When reps feel they aren’t going to make their goal, they hold back intentionally so that they get a lower goal the next year. In many cases, it’s premeditated. They see their underperforming counterparts getting smaller quotas, and so they model their behavior. 9. When your team’s quota is unreachable, it can degrade your brand’s reputation. Setting an unattainable quota hurts more than just your own internal team. It can affect your company’s public appearance. It can cause sales reps to blatantly over-promise prospective customers just to close a deal, and people react more adversely to deceitfulness than any other attribute. Chances are, you’re already using approach #1. If that’s the case, as you get ready for next year, try #2. Either way, download easy quota calculator to crunch the numbers for you. When a company is under pressure to grow fast, it’s easy to resort to a top-down approach to setting a quota. It’s set strictly by sales leadership, focusing strongly on growth targets and loosely on rep ability. What does the business need to do to hit the CEO/Board/Exec team goals? What’s our average rep bringing in per market/territory? What’s the fudge factor for longer ramp and the sensitivity analysis around missing the plan? Because it plugs a quota and then calculates what’s needed to make it, the top-down approach is based more on expectation than reality. It causes the vast majority of unattainable quotas. When quotas are consistently missed, teams often hire more reps or trim out those who aren’t making it. The reality, though, is often that the quota is unattainable altogether. This strategy starts with what you know reps are capable of to get to what the board’s looking for. 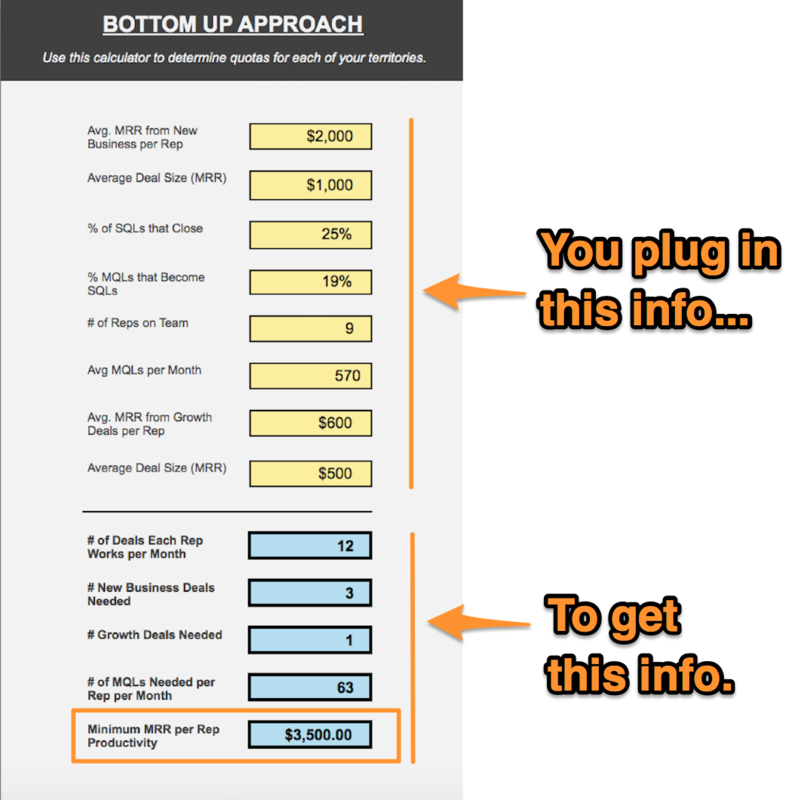 What are the stages of our sales and marketing funnel? What are the conversion rates between each stage? What do conversion rates look like according to each market/territory segment? So, not only are you pulling quotas from your rep’s realities, but you’re factoring in other teams and abilities by segment. This ensures that each territory or market segment your team is split into has a fair shot. 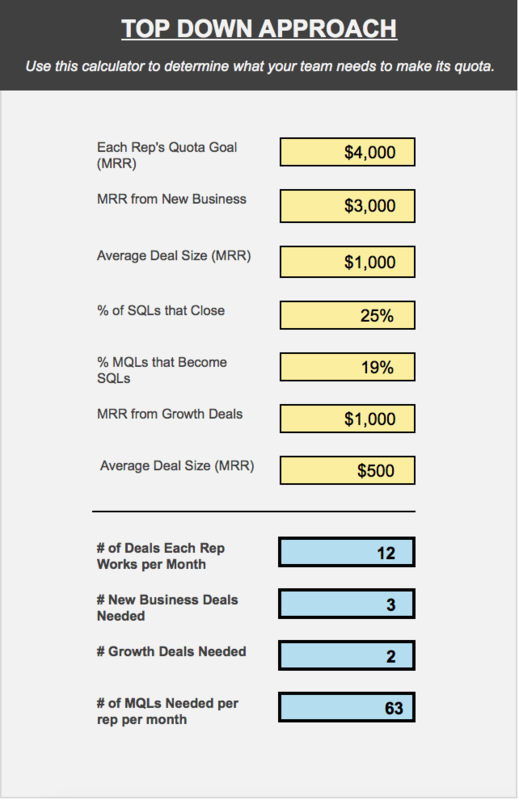 For each market segment on your sales team, you should calculate a different quota. It’s important to take this step because conversion rates can vary. At Yesware, we’ve found that conversion rates for SQL → Close varies as much as 4x between SMB and Enterprise segments. No matter which approach you choose, going through and identifying numbers to plug into the calculator will serve as an advantage to you beyond using the calculator. It lets you objectively look at your numbers and percentages and evaluate them. If you recognize, for instance, that your MQL → SQL conversion rate is very low, you can probe further and identify the root of the issue. Once you’ve set a quota, you can have conversations with your team about what you’re going to optimize the process to make the business work better. Use a data-driven approach; if you just slap a number that’s backtracked from growth goals, it will come back to bite you. If you’re seeing low performance and/or turnover with your team, do a temperature check to see if there’s misalignment. Talk to front-line sales managers and reps to quota-setting a collaborative process, not a tops-down one. The long term value of your employees > forcing over-aggressive quarterly results. In the short term, it might seem sensible to have a high quota because you’re under pressure and need to make a goal, but in the long term that decision could cost you the employees sitting around you. Set your sales goals by territory, not by rep performance. Making this change alone can increase sales by two to seven percent. 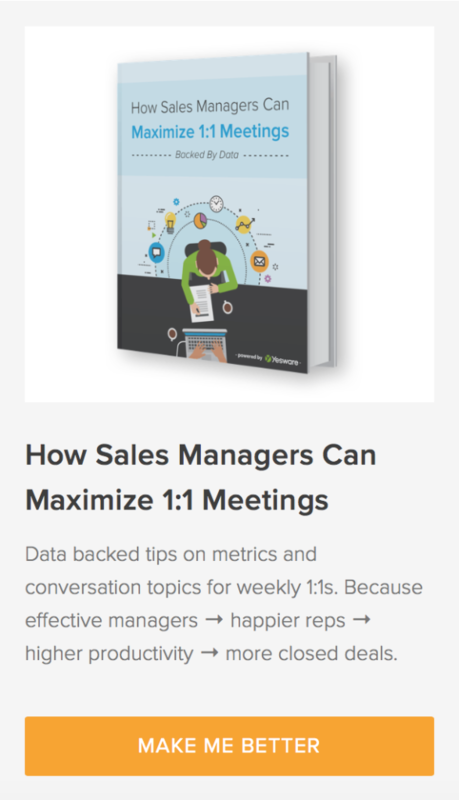 Communicate clearly to your sales team how you’ve calculated their quotas so they know exactly why their numbers are what they are. Take away the curtains and it eliminates the negative gossip. Food for thought: consider experimenting with commission based on profit not revenue. This disincentivizes sales reps from offering discounts. That said, it only makes sense if your salespeople are currently offering discounts and if it it’s easy to report on profit vs revenue by salesperson. Have you tried Yesware? Our free trial arms your reps with tools they’ll love.